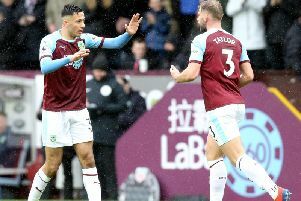 Burnley gate-crashed former boss Eddie Howe's 40th birthday celebrations after goals from Chris Wood and Robbie Brady secured a 2-1 win against AFC Bournemouth. The Clarets showed no signs of a hangover from Sunday's unhappy ending against Arsenal at Turf Moor, though an ever-present back four was broken up following injury to right back Matt Lowton. The away side, who had the experienced Phil Bardsley to fill the void, matched the intensity of their opening against the Gunners on the South Coast, moving the ball intelligently and keeping goalkeeper Asmir Begovic busy. The visitors had the Bosnian stopper beaten inside the first five minutes but the woodwork came to Bournemouth's rescue. An unmarked Ben Mee unselfishly guided Brady's corner back in to the mix and Wood's looping header clipped the top of the crossbar. It wasn't long after that Brady got in behind Cherries' skipper Simon Francis down the left hand side but the winger stubbed the turf at the moment of impact and the ball sailed in to the side-netting. Begovic's first real test came on the quarter-of-an-hour mark when Wood's header in to the ground from Bardsley's delivery caused the former Chelsea keeper problems but he came up trumps when flicking the ball over the bar. There was no stopping the visitors at the Vitality Stadium and, after Johann Berg Gudmundsson failed to test Begovic from distance, the Clarets went close again. Wood, stood up by Nathan Ake inside the penalty area, did well to bend the ball around the back of Bournemouth's recovering defenders but Jeff Hendrick's shot from close range was blocked by Steve Cook. However, Sean Dyche's side wouldn't be denied again. Brady was instrumental, firstly flicking the ball inventively in to Jack Cork and then, from the return pass, crossing for Wood to tap home from close range. Burnley needed a second goal to show for all their good work and it arrived in the 66th minute. Gudmundsson engineered the break before picking out Brady on the edge of the box. The winger spotted the aperture in-between Andrew Surman and substitute Lewis Cook before threading the ball out of the reach of Begovic and inside the post. The hosts set up a nervy finale when Joshua King pulled a goal back in the 79th minute, turning the ball home at the far post after Nick Pope had denied Jermain Defoe, but Burnley held on to secure a 14th point on the road, the third best return in the Premier League.